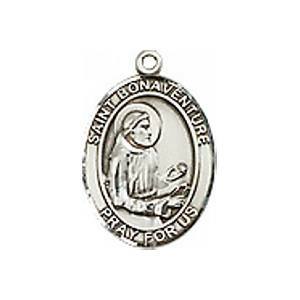 This Saint Bonaventure medal includes a heavy 20 in. Stainless Chain and a Deluxe Gift Box. Patron Saint Medals are great Catholic Gifts for a variety of occasions. They are among the top Confirmation Gifts but also have a place as a First Communion Gift or a RCIA Gift. Sacramental events are among the most popular times to give the gift of a patron saint medal, but often times because patron saints cover a wide variety of different life situations and vocational endeavors, they make great gifts at other times too. Saint Bonaventure is the patron saint of those with bowel disorders. The vertical measurement of this medal is 2 cm. In order to provide greater detail, medals are not shown actual size. The measurements given can be compared with those of the following coins.